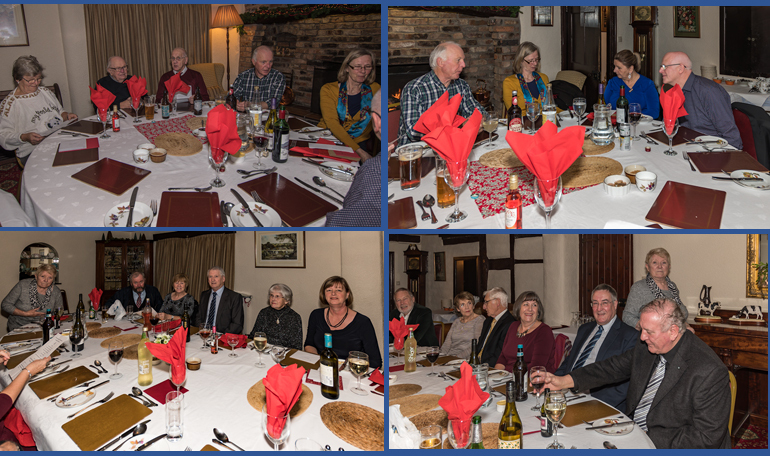 Twenty merry members of MCCC turned out on a damp, dark, December evening for a Christmas feast at Manor Farm, Byley near Middlewich. Knowing we wouldn’t be able to refuse the offer of two desserts, most had eaten little all day with one or two admitting to feeling famished. So, it was no surprise that as the food arrived a hush descended across the room and conversation ceased for a while as we tucked into the delicious home-cooked meal of traditional Cheshire turkey and all the trimmings. The roaring fire, the pretty Christmas tree and the homely décor of this farmhouse had changed little since our first visit last year, so no wonder then that it was unanimously agreed we will return next year for our very own “home from home” private banquet. Diary Date: 13th December 2017 – and yes Colin there will be damson pie!